UK Release Date - 21st February 1980. Special Formats - Japanese/Italian/Dutch versions feature custom OTTN album cover artwork on sleeve. The first single from 'On Through The Night' was released in 1980. 'Hello America' was a new version of the song recorded for the album and also featured a new track exclusive to this release. 'Good Morning Freedom' was only available on this 7" single. The single reached number 45 in the UK singles chart, narrowly missing out on a Top 40 spot. Various international releases used the album cover as the artwork with the song titles written over the top. Joe's surname is misspelled as "Elliot" on the UK seven inch silver label. The paper sleeve with US flag artwork was issued with the first copies of the single. It was also available in a black and red Phonogram paper sleeve that has a hole in the middle to show the label. 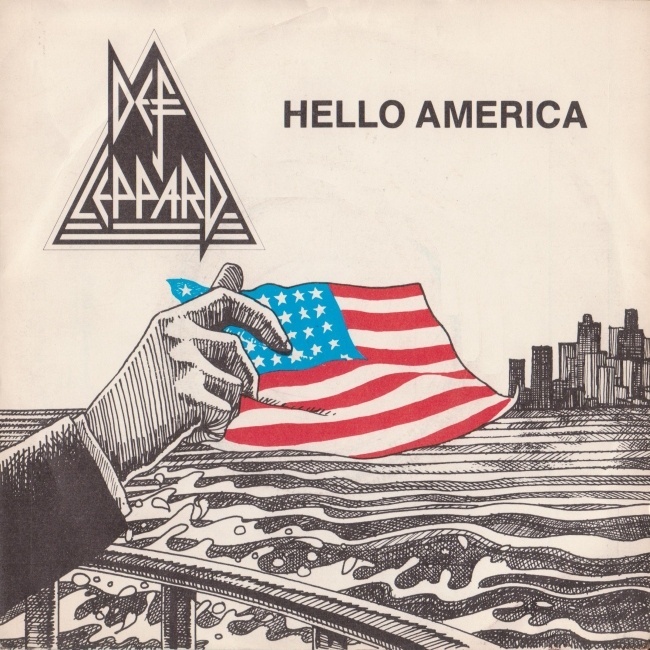 The reverse of the picture sleeve was light blue with the triangular white/black Leppard logo in the middle, 'Hello America' listed in red with the B-Side title and info below that in black writing.